I was born in Melbourne, Australia. I developed an interest in the American West and the Native American Indians when I was growing up and the first book I read was "Bury My Heart At Wounded Knee" by Dee Brown. I have visited the USA and travelled to some amazing sites such as the Battle of the Little Bighorn Memorial. the Black Hills and Fort Laramie which features in the book but my favourite place would have to be Yellowstone. I completed a historical fiction writing course and that is where the idea came about for writing this novel, my first. I love the American West era, the history, the people and the colourful stories. I am currently working on a sequel to WHISPERS AMONG THE PRAIRIE, the characters that I developed I just don't want to say goodbye to. The first tragedy in Morning Dove’s life was the death of her parents from smallpox, a devastating disease for Native Americans brought by the white man. Morning Dove, a twenty-year-old South Cheyenne maiden, and her eighteen-year-old brother, Black Beaver, were raised by the tribal chief and his wife. Chief Black Kettle and Medicine Woman later instilled their love for peace in Morning Dove’s heart. The chief hired a white man to teach them the English language. At the same time, Clinton McKay, a veteran of the Civil War that had just ended, found himself untrained to do any available job in his hometown of Ann Arbor, Michigan. Joining the cavalry seemed like the best option, although he hated to leave his sister, a war widow, and her two young daughters. While Clinton thought the cavalry’s main focus was the protection of wagon trains and stagecoaches, he soon learned that killing the Indians was another goal. The paths of Morning Dove and Clinton soon crossed, and the story continues in Michelle Roberts’ historical novel, Whispers Among the Prairie. This book engages the reader from the first page to the last. Beginning with an everyday scene in a Cheyenne village and then moving to life in a Midwestern town after the Civil War is certainly intriguing. The author writes in a smooth, flowing style, capturing the reader’s imagination. There are a number of characters in both settings, and each one is aptly described. Likewise, the settings are also easy to imagine. 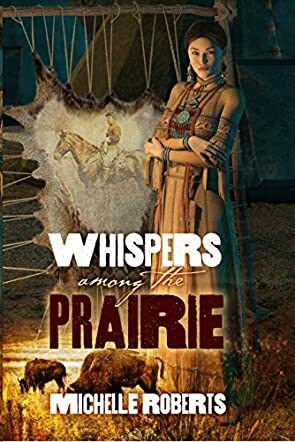 In Whispers Among the Prairie by Michelle Roberts a cataclysmic decade in the United States’ history is unforgettably portrayed.